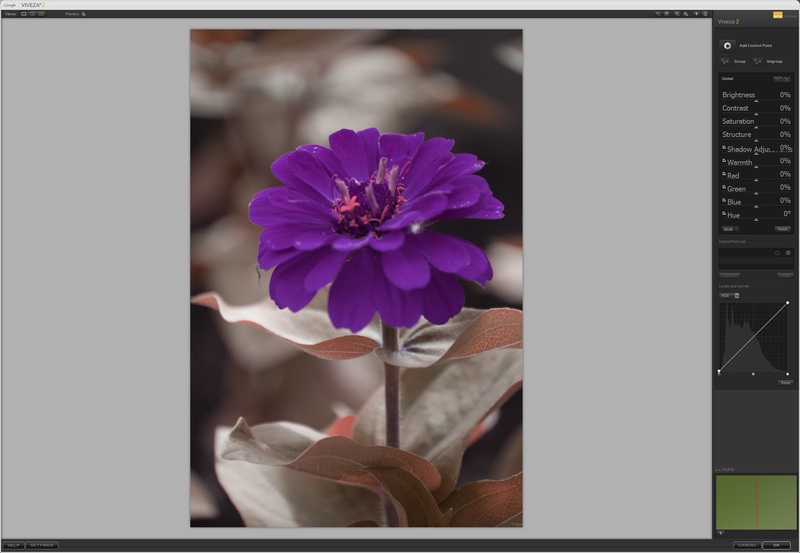 When exporting from either LR or Capture One 9 the image that appears in Affinity Photo for WIndows 1.51 has the correct color and appears to have all the adjustments included. However, when using the NIK plugin in Affinity the image colors are much darker and has a blue cast and the image appears flat. I have repeated this with several images with the same results. I have had to return back to PS cc when using NIK as Color Efex and Viveza are basically useless when used in Affinity Photo for Windows. Just out of interest, is the colour shift happening only when you present full-sized files to (say) Viveza? As an experiment, try arbitrarily resizing the file then applying Viveza - what happens then? Images looks good on my Mac from 33%, but not if they are smaller. Thanks guys - I don't have any answers, but this will be a useful data point for Serif. Viveza- 25% or less and colour in main window is washed out, all other magnification images in main window are OK. Loupe is correct in all magnifications. Color Efex Pro 4 - no issues at ANY magnification. Loupe fine. All other NIK plugins are fine. I run on an old Toshiba Satellite Pro AMD shared GPU with 8gb ram and SSD 128gb under Win 7. I was able to replicate the issue on my PC too but only in viveza 2. Also, it seems to only to happen when I open a raw file from AP. If I start of from a TIFF file, it seems to work fine except for the "side by side" preview which still displays the "desaturated" issue seen in the previous version. I'm finding the same as Hectorsm. It seems to only happen with images opened from raw files. JPG and TIFF seem OK. Using Windows 10. At it is only Viveza2 at full screen view, the colors are inverted in the main window, navigator in Viveza has the right colors. It does not matter whether a TIFF or straight from a RAW develops, the display is inverted in full-screen mode, or rather, falsified. You can edit at least the picture in the right colors something annoying is already. Changes to nik while every other program supporting PS plugins seems to habdle them just fine.. doesn't make sense to me. Also at the original poster : there is a known issue with Viveza and the colors (while not zoomed in ). Color Efex is fine. It seems the trouble you afe having is coming from somewhere else as nobody else has that issue. Maybe something in your color profile configuration? Nik tools seems to be a widely used plugin set even without further development. So Affinity should adapt its output to Niks requirements, even if it requires special handling just for this plugin set. Interesting to know whether LR and Capture One had to adapt also to Niks "alternative facts" or whether they did the things just "right" from the beginning. Hi, my first post here on the forum, even though I've been using Photo for a while now. Great software! Keep up the great work! I apologise for posting this in the Windows bugs section, but I can also repeat this bug with NIK Viveza on Mac OS (Still on 10.11.6 El Capitan here, 2011 Macbook Pro). In fact it's been driving me a bit crazy, having to reopen to edit in Viveza via Aperture (yes, again, old school- but it works). TIFF files opened into NIK from Affinity Photo lack contrast, saturation, and generally appear washed out. Use GPU in the NIK preferences has already been set to 'OFF' (although this preference seems absent in Viveza). Also, the strange thing is that on the Loupe within Viveza, the colourcast/brightness/contrast is how it should be. I really hope this isn't a bug in Viveza and not Affinity Photo, as it'll mean Serif 'cloning' these otherwise amazing tools, and putting them in Photo. Just saying. Note that the NIK filters are no longer supported but if you edit in 8bit mode and view at larger than fit you should see it normally. I'm having the same problem with my Macbook Pro. Colorefx is OK but washed out coiveza. Seems this is going on for over a year. Aren't Affinity interested? We are interested, but we have lots of things to work on, so we have to prioritise what bugs to fix, or features to add. I have the same problem, I have just purchased the Nick collection by DxO, and the TIFF and raw and PSD files show false colours, however the JPEG file shows up normal in Viveza. 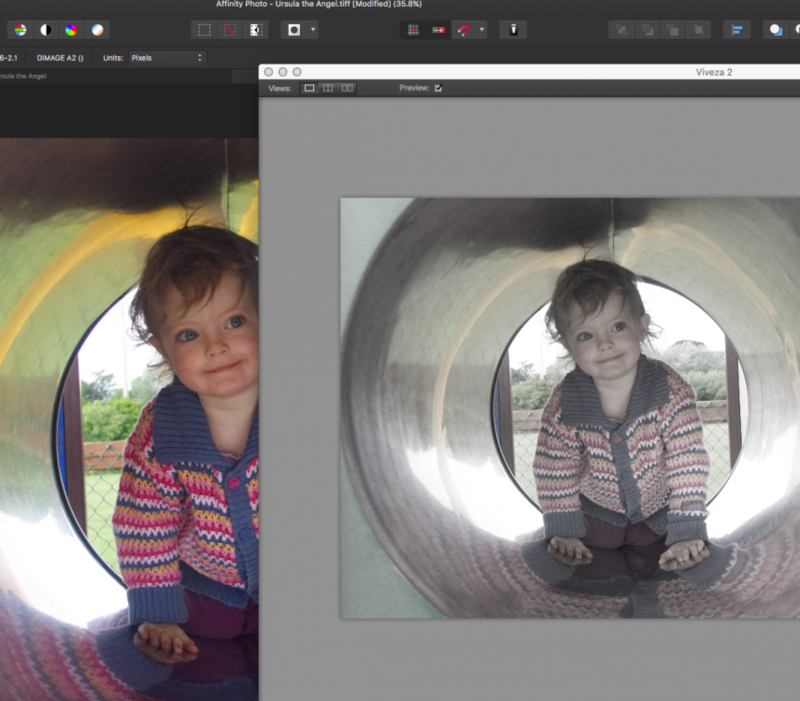 The enlarged loupe image shows the correct colours in all circumstances, I have contacted DxO and they are not supporting plug-in problems with Affinity Photo. I gather the problem lies with Affinity Photo... I hope you can fix this. That is exactly my problem using Windows 10 Pro. Below 33% magnification, I will see a washed out image. This bug only happens with Viveza 2. All the other Nik tools work flawlessly. I feel really bad about this problem and Customer Service at Affinity Photo won't respond. This does not happen with Adobe Lightroom or Photoshop. Edited August 24, 2018 by Omar Upegui R.
I have a similar colour deviation in Viveza 2 as part of the former Google Nik Collection. A solution that's working , is to export the picture as a 16 bit TIFF - then leave Affinity - then simply drag the 16 bit TIFF file directly into Viveza. I read the response, but that doesn't solve the problem. I paid for this software and expect that it would work correctly. Viveza 2 is the tool I use the most. 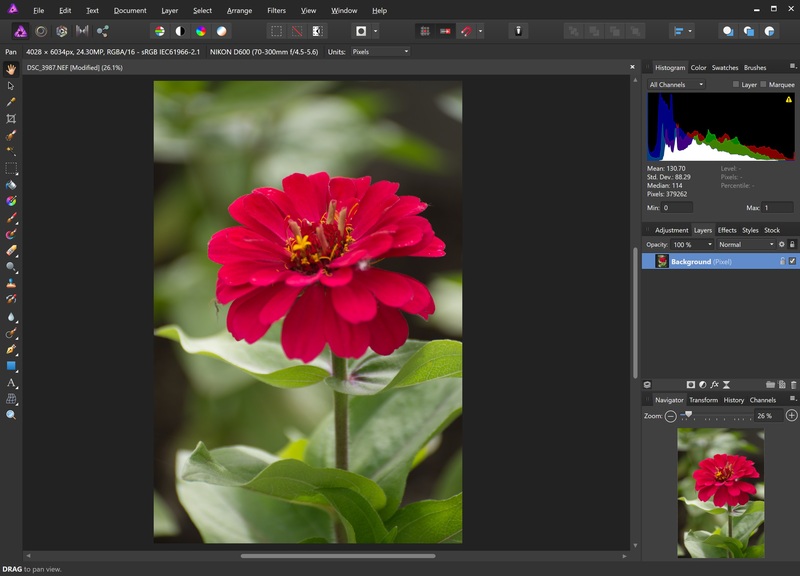 Not happy with Affinity Photo and will most likely jump to Adobe's bandwagon if the problem is not solved shortly.